A confidence pool takes your standard pickem, and pushes it to a new level. With confidence style picking, you are given values from 1 to X. X is the number of games in a week. If your pick is correct, you are awarded that many points. It can make for some high point weeks if you can accumulate some wins. This image shows how the picksheet works. First you select your pick, and then click on the confidence box, and select the value you wish to place on that game. If you`re really confident, you place a high value like 16 on that game. You are only given confidence values equal to the number of games in the week, so when there are only 14 games, the highest confidence value you will have is 14. Once you pick a confidence value, it`s value cannot be used on another game. Scoring of your confidence pool will swing wildly during the games in play since a lead change in a few games will add or subtract large amounts of points from the players depending on their picks. As you see the games coming to a close, you will notice things settle down with the point swings, and players settle into their rankings where they belong based on their predictions, confidence values, and game outcomes. Try it out, but beware, it can be addictive! We offer you a wide variety of Survivor style pools. They include the Loser style pools as well because the premise is still pretty much the same. We`ve added a few options over the years though, so you may even be able to spice up your Survivor / Loser pool with some twists. 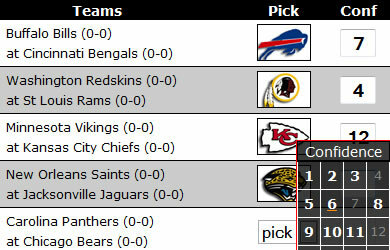 NFL Confidence pools can now be run along side your regular pool as either an extra game, or make it your showcase game. Want to try a new pool idea that is a lot of fun, won`t take much work filling out picksheets, and could generate a lot of excitement for your pool? Probably one of the most important functions of your pool is the ability for you to manage it. When you setup a pool with superbrawl, your player id is setup as the manager of the pool in addition to being a player. This gives you the ability to launch your manager console, while you are playing, viewing a trashtalk board, doing your survivor picks, or just showing up to view your pool. To launch the manager console of your pool, login using your player id and password, and you will see this tools icon in the login bar.